Equine Canada proudly announces that the 2010 recipient of the Equine Canada Sponsor of the Year is Masterfeeds. Masterfeeds was founded in Toronto in 1929 and has proudly served Canada for 82 years. In 2009, Masterfeeds was awarded the distinction of Official Gold Feed Partner of the 2010 Alltech FEI World Equestrian Games (WEG). Not long after, Masterfeeds partnered with Equine Canada to develop ways of promoting and supporting our Canadian Equestrian Team on their journey to WEG. 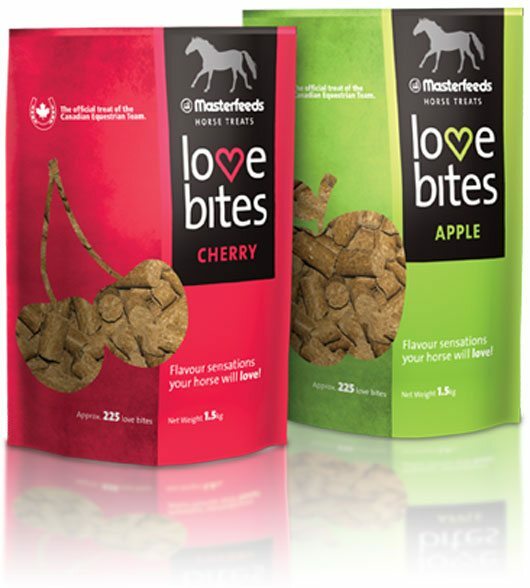 Masterfeeds believed so strongly in the value of Canada’s national team and their impact on Canadian equestrians that they invested in the research and development of a new equine treat dubbed “Love Bites,” which would become the official treat of the Canadian Equestrian Team. Masterfeeds also committed $1.00 from every treat sale to assisting the Canadian Equestrian Team at WEG. Sold nationally, these treats were a huge success with Canadians and their horses, which resulted in Masterfeeds’ generous 2010 donation of $20,000 to support the Canadian Equestrian Team. Great care was taken in the selection of this award, which prominently features building blocks, as indeed, sponsor generosity and support offers the opportunity for Equine Canada to build and sustain ongoing programs and initiatives to its membership. At the Equine Canada Annual Awards Gala, on Saturday January 29, 2011, in Ottawa, ON, Jackie VandenBrink accepted the Equine Canada Sponsor of the Year Award on behalf of Masterfeeds.